This fingerless satin glove is opera length. It is absolutely perfect for brides, bridesmaids, proms, and any formal occasion. It is made of a comfortable 90% nylon and 10% spandex which makes for a perfect fit. The length of this glove is approximately 18 inches (46 cm) from the top of the hand to the end of the glove. 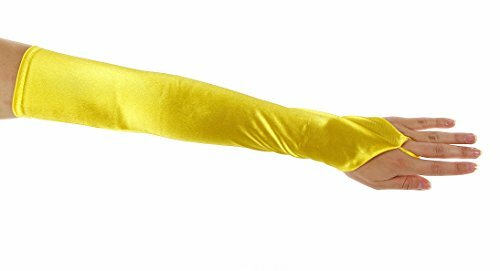 This beautiful satin opera gloves comes in many solid colors. We have a color for any formal occasion. This is a high quality glove and one size fits most ladies. Greatlookz and Finale Gloves also offers many styles and colors to fit any special occasion or event you have planed.